If you're anything like me, you've definitely spent some time standing in the paper towel aisle. completely overwhelmed with all your options and then left with the first thing within reach. There are a LOT of options out there and it's hard to choose. 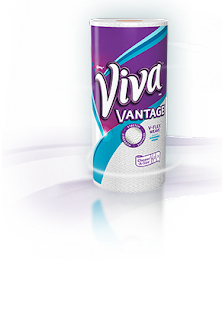 I recently received a sample the new Viva Vantage (Kleenex) paper towel to review (through Influenster) and I am super excited to share my review with you! As far as the 'stretch factor', I did notice that the paper towels don't rip nearly as easy as other paper towels I've used. I pulled on them quite a bit and while they're not super stretchy they do have some give which helps them stay intact. These paper towels are strong. Not only do they not rip easy when they're dry, but even when they're soaking wet they don't rip easily. I HATE when my paper towel rips. Sometimes to dry lettuce quickly I'll throw it in a bowl or ziplock with paper towel - usually, I am pulling out the paper towel in wet pieces. I am happy to report that this was NOT the case with the Viva Vantage towels. They soaked up the water quickly and I wasn't worried about left over pieces of paper in my salad. You really can use them to scrub. We had a few good spills on the floor (and counter and patio table and kitchen table etc etc) and given the state of my floors, some extra elbow work was involved. The towels stood up to the scrubbing without issue. I also LOVE the adjustable size. This is a MUST in a paper towel for me because I really don't like having to use a massive piece for a little job. I'm thrifty with my paper towel! Price: looks like they range from 1.15 - 1.99/roll. I'm not pro on the price of paper towels but that seems about average to me. Plus, it looks like there are lots of coupons out there AND there will be sales! Would I purchase: absolutely! I don't have a favorite paper towel at the moment so if the price is right, I would definitely add to my grocery cart! *Disclosure - I received a free product sample in exchange for my opinion on the product.